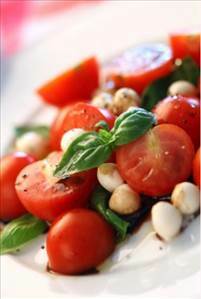 Drain and rinse chickpeas, halve tomatoes, slice cucumber, tear basil and slice olives. Combine chickpeas, tomatoes, spinach, cucumber and basil. Sprinkle olives on top. Drizzle over the olive oil, balsamic and lemon juice. Pepper to taste. A delicious breakfast for Sunday mornings. There are 228 calories in 1 serving of Chickpea, Tomato & Spinach Salad. Calorie Breakdown: 45% fat, 41% carbs, 14% prot.